Designed for high volume ECG environments, MAC 5500 offers a complete suite of advanced ECG Analysis programs. Combined with MobileLink™ wireless ECG workflow solutions, MAC 5500 helps you capture, analyze and communicate ECG data with greater speed and confidence. 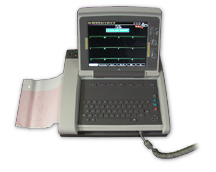 The MAC 5500 interpretive electrocardiograph with 12- or 15-lead analysis, full-sized paper format, alphanumeric keypad and standard monochrome waveform display. Marquette 12SL ECG analysis program for adult and pediatric interpretation. Options include data transmission, remote query, Hi-Res, PHi-Res, and color display. AC line or battery operation from NiMH battery. Click the button below to add the GE MAC 5500 EKG Machine - Color to your wish list.